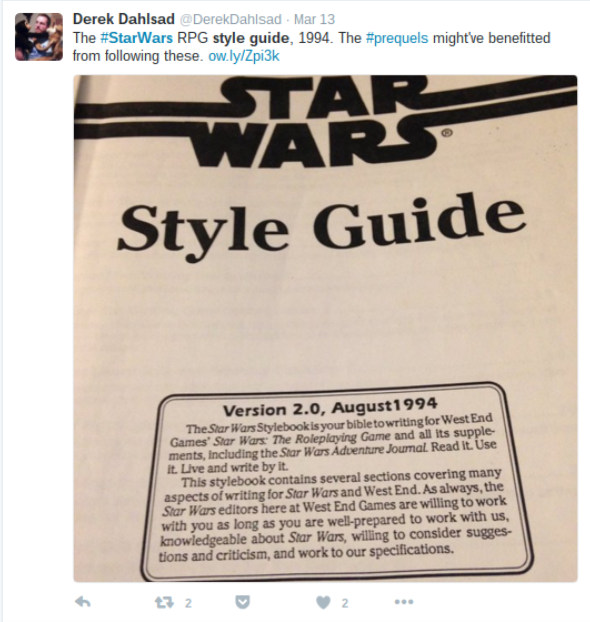 The guide was originally created for the writers of the Star Wars roleplaying game (from West End Games) so that they could create new characters, worlds and themes that would stay consistent with the Lucasfilm brand. 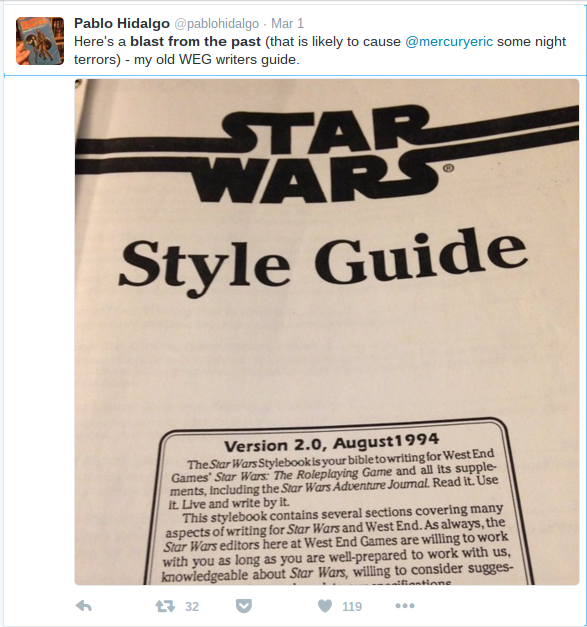 Rather than just listing out how to capitalize “The Force” or stating whether or not “hyperspace” is one word or two, the style guide also gave the West End creative team rules to follow so that they could create new content that would fit inside the Star Wars ecosystem. 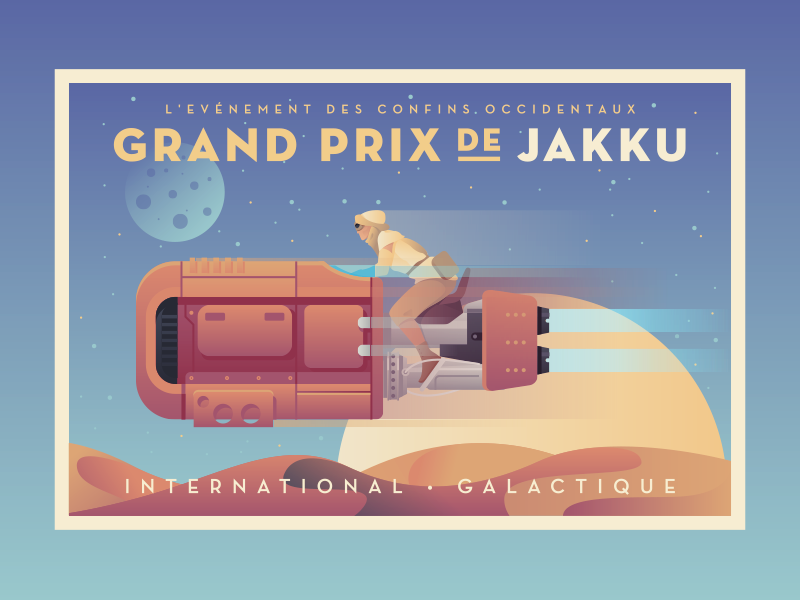 Lucasfilm created a style guide to ensure a successful creative process. Star Wars Episode VII: The Force Awakens shattered the record for biggest opening box office weekend by grossing $247,966,675. It’s safe to say that the people over at Lucasfilm know how to make a successful movie and we already know that the creative team uses a style guide to help them with their projects. Style guides are a necessity for a successful creative process because they allow you to keep your message and brand consistent throughout all of your work. While you may not be in the movie business you can definitely use a style guide to make your own projects successful. Below you’ll find additional reasons on why style guides are important. Ok, I know you may be thinking, “style guides are great for a billion dollar company like Lucas film but I don’t need one for my business.”Here’s the deal: If you want to be a publisher in today’s marketplace, you need to operate like the big players do. For example, big brands like Mail Chimp and Mozilla all have style guides. 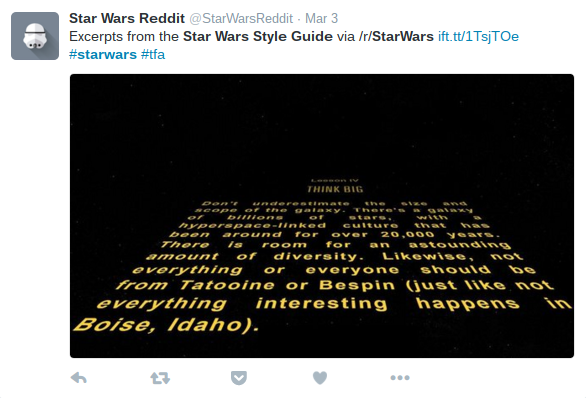 This isn’t even the first Star Wars-inspired style guide we’ve seen either. 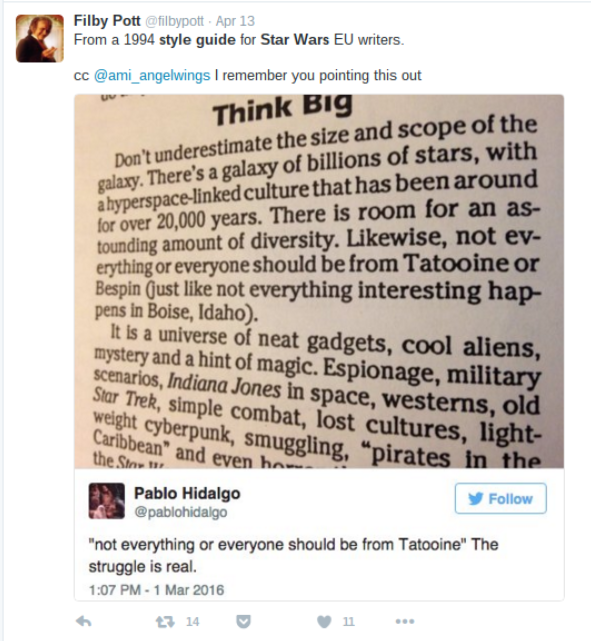 A few months prior to “the tweet heard ‘round the galaxy” the LA Times compiled and released their own Style Guide that will cover the ongoing saga of Star Wars.The Times’ style guide will be used internally to help their writers stay consistent when they cover Star Wars topics. Successful companies use a style guide because it helps you create great content which is important for your overall marketing strategy and branding. Star Wars has a legion of diehard fans because of one thing: Their brand. Customers don’t make purchasing decisions based on logic. They buy based on emotion.Your brand is what creates that emotion. Your brand tells your company’s story and creates a unique positioning for your business.It’s what separates you from your competitors and is the reason why people buy from you instead of them.Most importantly, It allows you to create an emotional connection and build trust with your audience. People buy from businesses and other people that they like and trust. 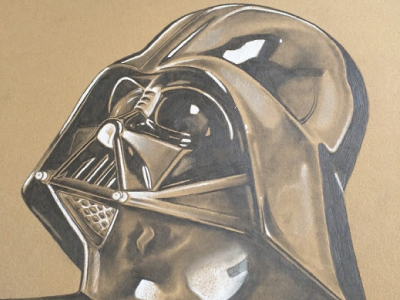 The Star Wars franchise has been so successful over the years because it has created an emotional stir in millions of people.which has resulted in a cult following. 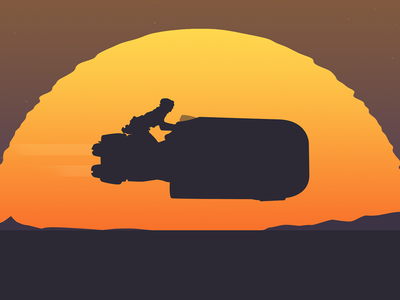 Your business may not have a billion dollar budget like Lucasfilms. But, you do have a brand that you must use to win over customers.You must make them feel a certain way about you and that is what branding accomplishes.You must use your content to shape your brand in the minds and hearts of your audience. You may already be working on crafting and/or promoting your brand but you’re probably missing an important step in the process.To gain the trust of your audience your brand must have a clear identity and a consistent message.Your audience needs a clear message that sets you apart from everything else and sometimes that message becomes unclear when different voices are promoting your brand.If your business has many different communication channels and voices (social media, blogging, your employees), how can you keep your message consistent? A style guide provides the foundation for your brand’s content and allows you to create a consistent message that will establish an emotional connection with your audience, build trust and ultimately lead to more customers (and happier ones too). It’s been 38 years since A New Hope was released and times have changed. Advancements in technology have given the franchise more tools to create better special effects in the movies.Also, Lucasfilms can now use online, collaborative style guides when creating new films instead of printed manuscripts that are difficult to revise and keep updated. If you’re just starting to put together an online style guide, or updating an old one, you may find it difficult to find an option that will satisfy all of your needs. You need a quality solution that’s simple and affordable. Frontify successfully combines your brand’s guidelines with the digital age using their easy and fun online style guide creation platform. With Frontify you can easily create a style guide from scratch or using templates in only minutes, even if you have no experience, using their easy to use style guide editor! Click the following link to get started for free!